Can you believe that today is the last day of August?! It feels like this month just flew by so quickly. 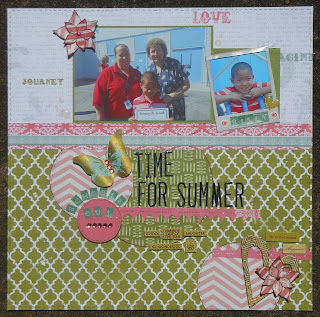 I wanted to remind you that today is the last day to enter the August "Animal" challenge at Crafter's Companion. To inspire you I have one last card to share for August. 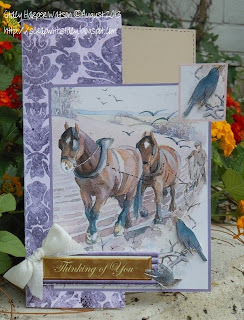 I made this card using the CD-ROM from The Country Diary of an Edwardian Lady. If you haven't already tried out one of Crafter's Companion's CD-ROMS you should really get one and see what all the fuss is about. They are chockful of scrappy goodness! AND so easy to use! I decided to make a shaped card and just printed out the sheet of the one that I liked the best. I was drawn to the horses on this one. After I printed it out twice, I fussy cut out the card itself from one copy and then fussy cut a few of the birds from the second one. I also printed out a sheet of sentiments and cut out the two I planned to use, one for the inside and one for the outside. Next I just put it all together. I layered the extra birds on top of the birds that were on the base card with double sided adhesive squares for a bit of extra interest. And then I made a bow with my Ultimate Tool and added it to the sentiment that I added to the front of the card. 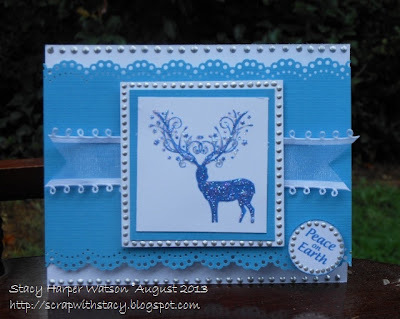 And voila...I have a very pretty card that works perfectly for this month's Animal challenge at Crafter's Companion! Now it is your turn to go get scrappy. Thanks for stopping by today. Until next time...happy scrapping! TGIF! Who's ready for the weekend? I'm super excited because it is a 3 day weekend for us and we have nothing planned. I think those are the best kind because the possibilities are endless. I'm hopeful that we will be getting in the pool this weekend and that I will get to scrap but other than that I am open to the possibilities. What are your plans this weekend? I was able to make this end of school/beginning of summer layout (finally! ha) and I wanted to share it with you. The photos are of my son from the last day of school with his teachers. I was inspired by a fun sketch challenge at Sketches4all. I loved the sketch so I grabbed some papers from my stash and got busy. 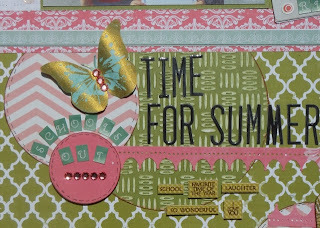 I used the 6" X 6" Embossalicious Embossing Folder - Gun Metal from Crafter's Companion for one of the circles on my layout. I embossed the paper with my eBosser and then sanded it until you could see the cool design really well. Then I die cut a circle shape from it. The flowers are some that I made for a mixed media wall hanging and had a few leftover. They were stamped out with Memento Rich Cocoa Ink onto patterned paper using Sheena's A Little Bit Sketchy EZMount Stamp Set - Always Floral. 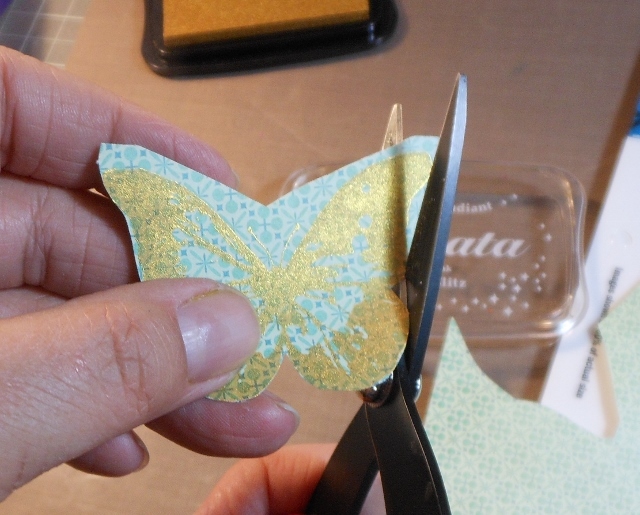 I used two different sized flower stamps and then fussy cut them out and layered them. First I grabbed my supplies. I inked up my stamp with the luscious Delicata! 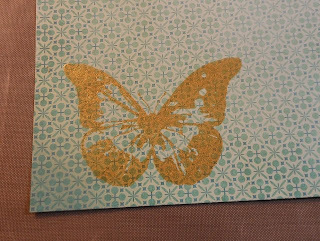 I stamped onto my patterned paper. Then I fussy cut it out. 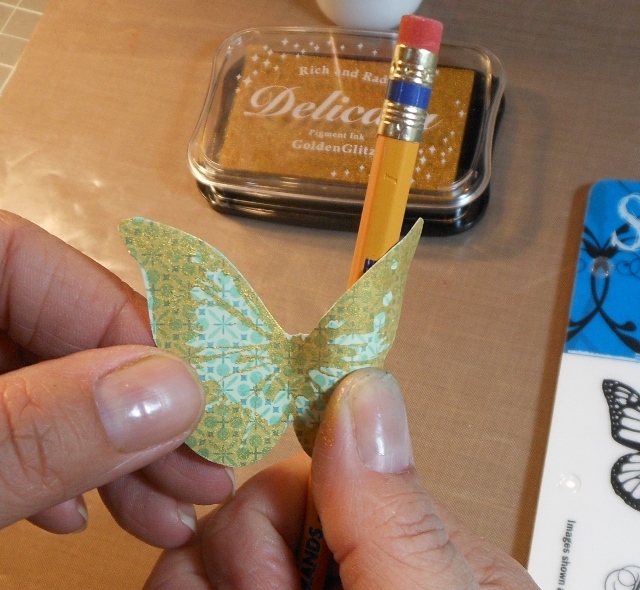 Here I am rolling the wings around my pencil to give them some dimension. And here is what it looks like on my layout with some bling I custom colored, with my Spectrum Noir marker in CR7, added to the body. Cool right? It was easy to make and I think it add something a little extra special to the layout. Thanks for stopping and looking today. Enjoy your weekend!! 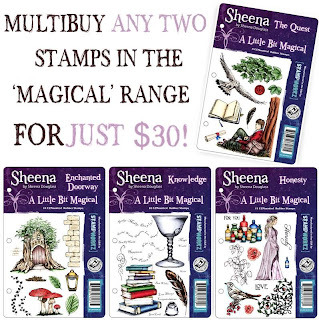 Drum roll please.....the new Sheena stamps are launched today! WOO HOO! As soon as you finish reading my post you must rush over and check them all out at Crafter's Companion. 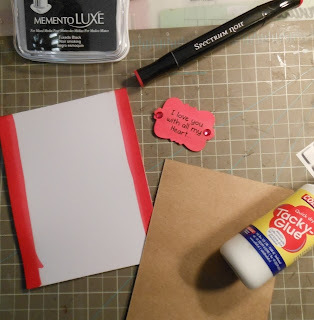 As you guys know if you follow me, my first love is layouts so I am always trying to find ways to incorporate all these yummy stamps from Crafter's Companion onto a page. A couple of days ago (Tuesday) I told you that I was having fun playing around with stamping on Sticky Back Canvas, well I stamped a bunch of stuff out that day from Sheena's A Little Bit Magical - Knowledge stamp set. And then I was making this layout and looking for something special to add when I noticed the stamped out canvas on my desk. Light bulb moment! I trimmed out a sentiment, the word-Happiness, and by gluing it to a decorative pin I turned it into a flag embellishment. Easy Peasy! I added it onto my layout in with a grouping of flowers. It was the perfect addition! 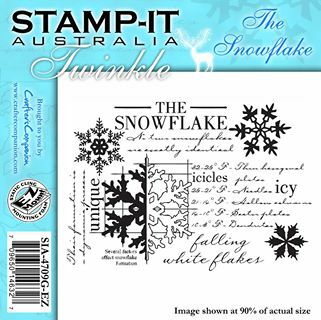 There are really so many ways you can use these new stamps! The photo on the layout if of 4 of my 5 kids at Lake Mead in Nevada. We camped out lakeside on our RV trip to Oklahoma this summer. It was a great trip and I have a stack of photos that I need to scrap! lol So be prepared to see more of them in the near future. 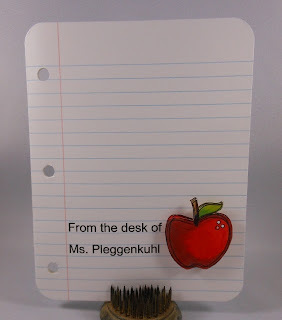 Last night when I was surfing along Facebook's main feed I came across a free download PDF from Jennifer McGuire Ink for Back to School cards. They were so adorable that I immediately downloaded all four of the PDF's and got busy making a couple. She has 4 different versions you can download and one is blank so if you are computer savvy you can add your own sentiment. Here is another card that I made using the blank version. I can totally see me making a box of these to give to the teacher as a gift. They are so fast to make and so cute, right? The download comes with two apples so you can color one and layer it if you want. Which is what I did with these cards. I colored it with my Spectrum Noir markers in TN8, TN2, CR9, BG4, CG2 and CG4. Don't you just love these cards? I do, so I had to share. I'm digging myself out from under piles of scrap stuff in my scrap room. As soon as I find myself I will try to get busy making some more new stuff! Thanks for stopping by today. Have an awesome Wednesday! Until next time...happy scrapping! 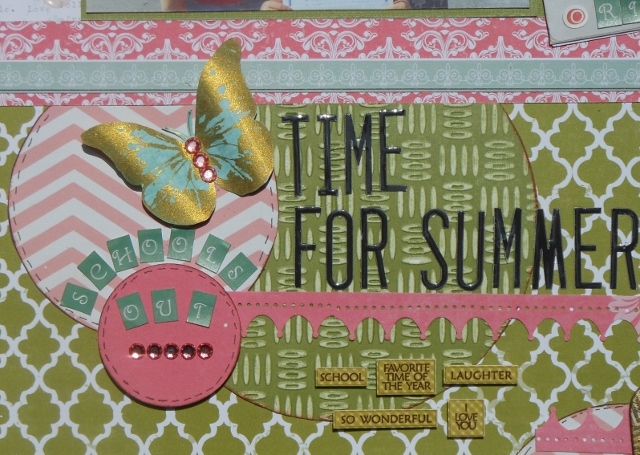 I wanted to show you a card I made using the soon to be launched Sheena's A Little Bit Magical - Knowledge stamp set. I've been wanting to try working on sticky back canvas so I stamped out my image onto a piece and then colored it with my Spectrum Noir markers in IG2, IG4, IG6, IG9, LY3. The Spectrum Noir markers colored beautifully on the canvas. I made sure to be careful when I got close to the edges to control color bleeding. I had this bit of yellow ribbon in my stash and I have no idea where I got it but I loved the way it looked around the edge of the canvas so I decided to use it. 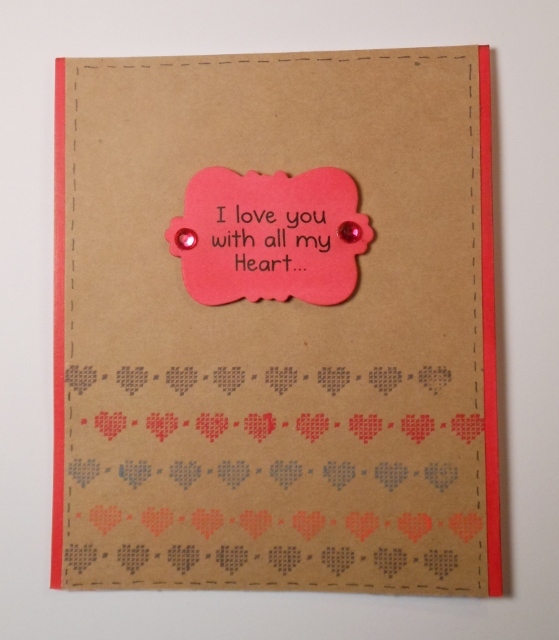 I stamped out the sentiment on a scrap of Ultra Smooth Premium White Cardstock. I colored the paper with my LY3 Spectrum Noir marker and then trimmed it out following the shape of the sentiment. I used double sided adhesive squares to POP it up off the card. I finished it off with some clear bling that I also custom colored to match with the LY3 SN marker. Happy 6th Birthday Crafter's Companion! I'm getting on the road to head back home today but I wanted to let you know before I leave that this week is Crafter's Companion's 6th birthday and they are celebrating all week! You are going to want to go check things out! 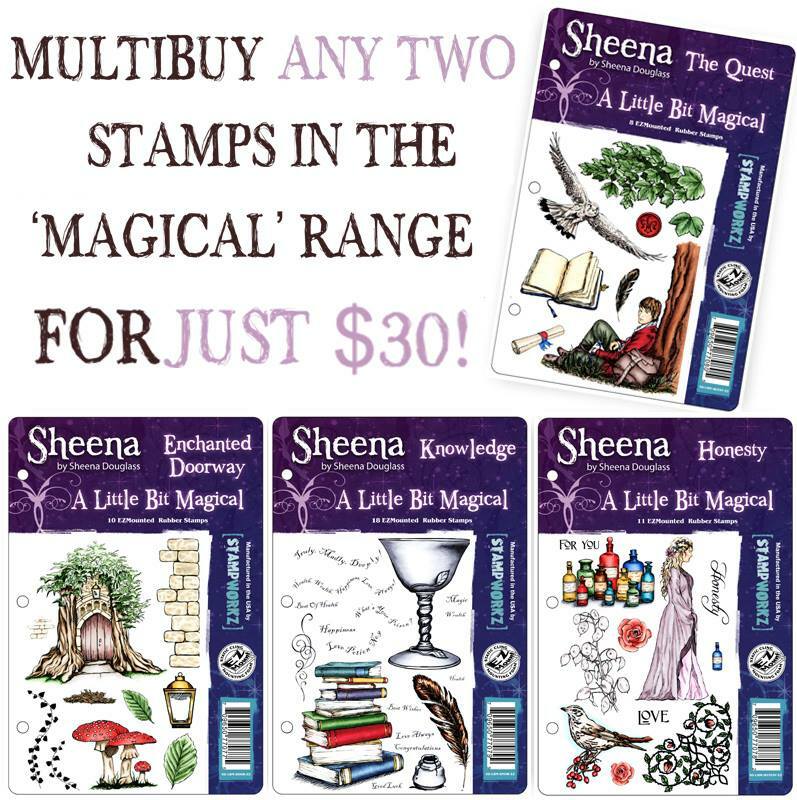 I know that there are going to be a couple of special stamp sets given away if you purchase over a specific dollar amount. If you spend more than $50 they will add the Stamp It - The Snowflake stamp set to you order. If you spend more than $100 they will add the Stamp It - Peace Deer stamp to your order. 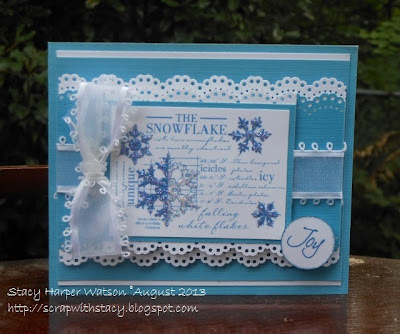 I was lucky enough to get to work with both of these stamps this weekend and here is a card I made with the Stamp It - The Snowflake stamp set. 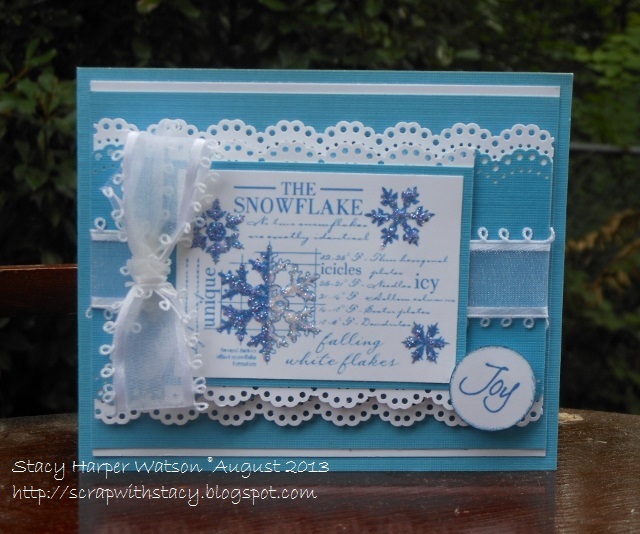 I pulled my sentiment from one of the beautiful sentiments on the Sentimentals EZMount Stamp Set - Jingle Bells. 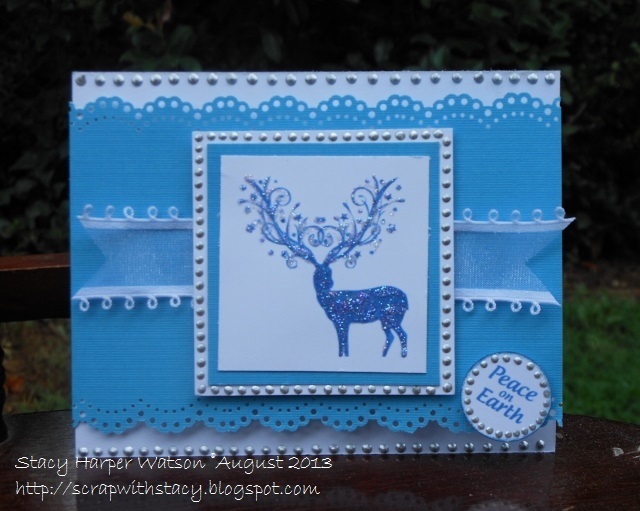 I was on a roll so I decided to make a second card and for this one I used the Stamp It - Peace Deer too. I was super excited when I realized that it was perfect for this months "Animal" challenge at Crafter's Companion! (Hello! There is a deer on it! LOL) If you haven't already joined in on this challenge you should get out your Crafter's Companion goodies and get busy! You could win the gift certificate to the Crafter's Companion store. Think of all the stuff you could buy! I don't know about you but to me this week zipped by so quickly! I'm heading back home to Nevada on Monday. School starts on the 26th so we need to get back and get into our regular routine. So I will be very busy packing this weekend! Hopefully I will get to squeeze in a bit of scrapping. I'm sad to say that the winner I picked for the free stamp set giveaway did not contact me in the time allotted so I had to choose a new winner. The new winner is: Kelly Massman! Lovely as I mentioned before and my favorite are all of the Beatrix Potter sets: http://www.crafterscompanion.com/Beatrix-Potter-EZMount-Stamp-Set--The-Tale-of-Benjamin-Bunny_p_746.html! Thanks! Congratulations Kelly!!! You will need to email me your full name and US mailing address to Scrapwithstacy(at)Gmail(dot)com by Sunday, August 11th or you forfeit your prize. Hope you all have a fantastic weekend! Until next time...happy scrapping! I used Tsukineko Memento Luxe inks in Grey Flannel, Rich Cocoa, Morocco, Love Letter on this card. These luscious inks are pigment inks and the color and coverage are amazing! They will be in the Crafter's Companion Store very soon! I wanted to use one of the edge stamps from this set to make my card. I pulled out some Kraft paper and my inks. The Heart stamp called to me so that is the one I used. 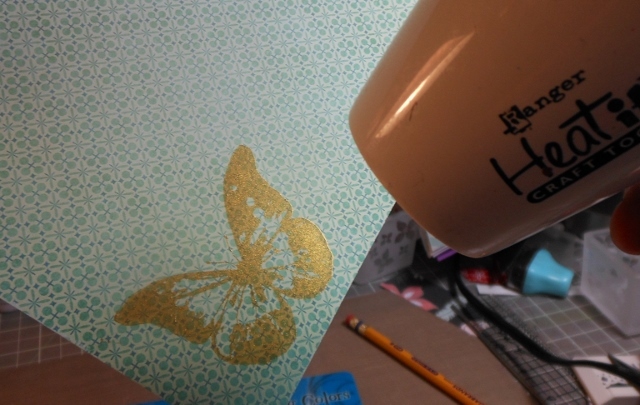 I started stamping the image with Rich Cocoa, next I used Morocco, then Grey Flannel, then Love Letter. I moved the stamp from side to side to nestle the hearts together. I finished up with Rich Cocoa again. Since these inks are pigment inks they sit more on top of the paper and take longer to dry. You can either set your project aside to dry for awhile or you can heat set the color. You will want to do this otherwise you might smear it. The beauty of pigment inks is that they are generally opaque so the colors are extremely vibrant. For my sentiment, I used a sentiment from the Barkley Rubber Stamp Everyday Set - Heartfelt Wishes. I stamped it out with Memento ink in Tuxedo Black onto a scrap of Ultra Smooth Premium White Cardstock for Alcohol Markers that I had sitting on my scrap desk. I decided to custom color it to go with my project. I used one of my Spectrum Noir markers that matched the closest - DR2. I colored the stamped image and then die cut it out. I added some clear bling that I also colored with DR2 to match. I decided that I wanted to carry the color to the card base. I pulled out a piece of Luxury Centura Pearl 8" x 8" Printable Snow White Cardstock and trimmed it a little wider than my Kraft topper. I flipped it to the non-shiny side and quickly colored a strip down the two side edges. I didn't have to be neat because the Kraft topper was going on top of it and would hide any imperfections. Here is what the colored edges look like before I added the Kraft topper. Here is it with the Kraft topper added to the custom colored base paper. Okay, you have waited long enough to find out the winner of the Crafter's Companion Design Team Welcome giveaway. Lovely! Thank you for the opportunity to win! Congratulations Amy!!! You will need to email me your full name and US mailing address to Scrapwithstacy(at)Gmail(dot)com by Thursday, August 8th or you forfeit your prize. Thanks to all who joined the giveaway! Until next time...happy scrapping! Who is Interested in a Giveaway? Woo hoo! The new term is starting today for the Crafter's Companion design team. And I'm still on it! Yeah! I am sad to see Stephanie "Arty Carty" Lee go. She was such a fab team member and I will miss her. We did however add a couple of awesome newbies that I just know you are going to love, Tenia Nelson and Leah L'Orange. As a fun way to start the new term each Design Team member will be giving away a stamp set on their blog. 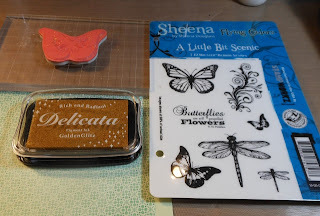 To enter to win the stamp set giveaway on my blog, you just need to leave a comment on this post telling me what is your favorite stamp set at Crafter's Companion and then link back here from your blog. The giveaway starts today Thursday, August 1, 2013 and ends on Sunday, August 4, 2013. I will announce my winner on Monday, August 5th and that winner must contact me with their full name and mailing address at scrapwithstacy(at)gmail(dot)com by Thursday August 8th or forfeit their prize. Unfortunately this giveaway is only open to folks with a U.S.mailing address. I am giving away the cool new Sheena Douglass A Little Bit Festive -Ivy Borders stamp set that we just launched! 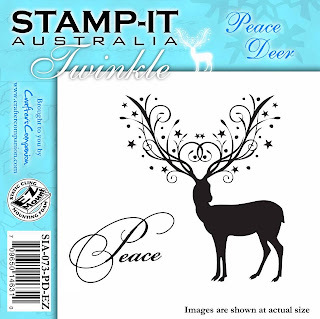 One of the things I love about this holiday stamp set is that you can use it all year long. You don't just have to use it for Christmas. In fact, I used it on a multi media wall hanging. I really had fun making this. I prepared my canvas with a coat of gesso. After that dried I pulled out some patterned paper from my stash and tore the edges. I adhered it to the canvas with some Claudine Hellmuth Studio Multi Medium – Matte. When that dried I found that I had some old sheet music that worked so perfectly with my "heart" theme so I adhered it on top of the patterned paper with the CH Multi Medium too. It was music for a song called My Heart Sings. Perfect! 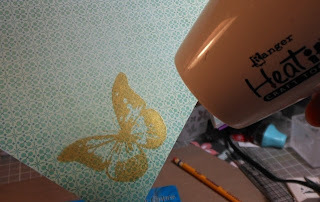 I took some Ranger Tim Holtz Paint in Broken China and rubbed it randomly over the paper and canvas and set it aside to dry. Using Tsukineko Memento Rich Cocoa Ink, I stamped out a gazillion flowers from the Sheena's A Little Bit Sketchy EZMount Stamp Set -Always Floral, layered them and added some Ranger Liquid Pearls – Rouge to the centers. While the Liquid Pearls dried, I decided to use some homemade modeling paste to add a bit of fun texture. I grabbed a mask from my stash and an old credit card and smoothed the paste over the mask. Then I lifted off the mask and I did this in a couple of places. Then I set the canvas aside to dry....again... ha This is the hardest part of doing multi media projects for me, the waiting for things to dry. 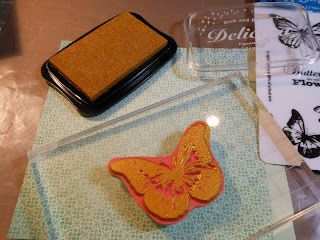 After it dried I decided to tone down things with a bit of Tim Holtz Ranger Distress Ink – Walnut Stain. I used my inking tool to darken the edges and the white of the modeling paste. After this, I laid out my flowers in a heart shape and when I liked the way they looked I adhered them to the canvas with some Collall Quick Dry Tacky Glue. I'm loving this new glue! Have you tried it yet? It dries quick and clear. 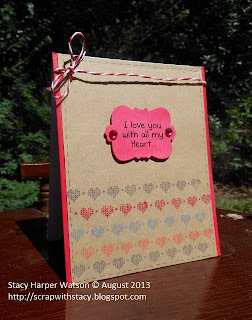 I stamped out a heart using some luscious Tsukineko Delicata Golden Glitz Ink. This ink is just so gorgeous I can't stop using it! I layered a few pieces of washi tape to the upper left side, stamped out a few of the hearts from the heart border stamp on the Sheena - Ivy Borders set. I took a piece of washi tape and covered the hearts I didn't need and then inked up my stamp. Then I took off the washi and stamped the hearts on my canvas. I added the inked heart with some double sided adhesive squares and it was finished. Good luck! Thanks for stopping by and looking today. Until next time...happy scrapping!